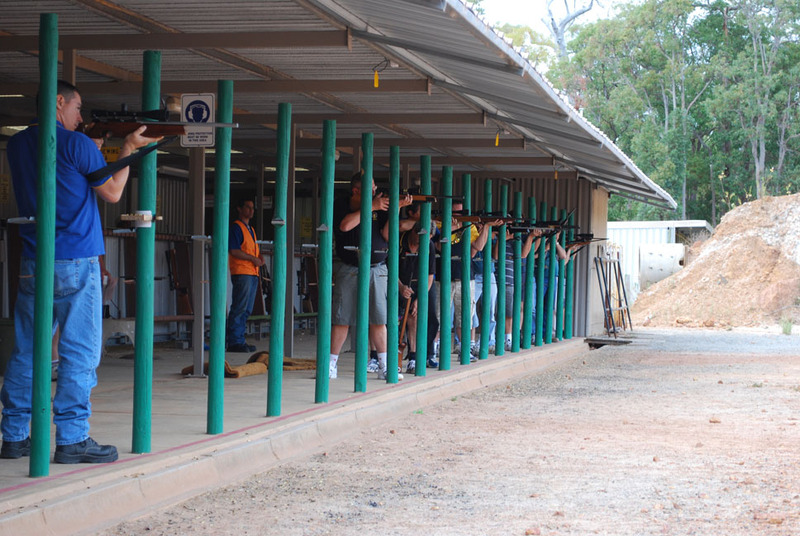 Southern Districts Rifle Club (Inc) was established in 1982 and has developed into a multi disciplined shooting facility with the capacity of hosting State and National shooting events. We cater for shooters of all ages whether male or female and actively encourage juniors to participate; the club can assist new shooters with club firearms and coaching for all disciplines offered. SDRC is also known as Gleneagles Range. All prospective members are required to attend 4 safety shoots and be deemed competent by the Range Captain, it is also a requirement to be a current member of the Sporter's Shooting Association of Australia to be considered for club membership. Membership runs from May 1st to April 30th and the fees are $65.00 per member or $70.00 per family membership. Range fees are payable on the day, $7.00 for members and $15.00 for non members, junior range fees are half price. In May 1982, Andie Currie placed an advertisement in a local paper asking that anyone interested in forming a shooting club attend an informational meeting he had organised. More than 100 people responded to his ad and as a result a suitable sight for the Southern Districts Rifle Club (SDRC) just outside of Perth was found. During the first year of operation, SDRC had about 40 members. Throughout the years the Club has seen considerable growth. Currently, it has close to 200 financial members. The Club has a 200m range that has closed in shooting mounds with 27 shooting bays. The clubhouse features toilets, hot shower, a canteen and bar facilities. An additional 50m range has recently been completed and offers a closed in shooting mound with 20 shooting bays. As well as catering to the needs of its members, SDRC offers coaching services to local pony clubs that participate in tetrathlon events, which see participants competing in shooting, swimming, running and horse riding. The Club also offers its facilities to Navy and Army cadets seeking marksman badges. The Club is host to several events throughout the year. It regularly hosts the Single Action State Roundup and also the Scoped 3 Positional and Field Rifle State Championships as well as operating registered matches for Club Championships and hosting National Competitions on rotation with other States. SDRC has a calendar which gives each discipline its own time to shoot with Saturday's always reserved for Rimfire 3 Positional & Field Rifle matches, each second Sunday for Centrefire 3 Positional and Field Rifle matches and every other Sunday sees Handgun shoot in the morning and Single Action in the afternoons. The facility is set up in such a way that allows members to take part in rimfire rifle night shoots throughout the year, providing a fun, safe and unique shooting experience. Lighting is provided for Wednesday night twilight Rimfire events. Southern Districts Rifle Club is affiliated with SSAA, which in turn is affiliated with the international Shooting Union, the Australian Shooting Association and the Australian Olympic Federation. Hence all members have the opportunity to qualify to compete for Australia in international competition. SDRC is located south of Armadale on Albany Highway. 1) To foster a better environment for participation in all aspects of the sport of shooting. 2) To promote, support or oppose legislation or any other measures affecting or likely to affect the sport of shooting generally. 3) To promote a better understanding between the public, landowners and shooting sports persons. 4) To promote the safe handling and use of firearms. 5) To do all things as may be conductive to the extension, implementation or incidental to the aforesaid objects. 6) To assist in the maintenance of a State Committee and to observe and enforce all policies and By-Laws of Sporting Shooters Association of Australia (Western Australia) Incorporated, and to do all things conductive to implementation of same.